I’m reading The Yearling to my children. The Pulitzer Prize winning novel by Marjorie Kennan Rawlings is set in the Florida scrub forests surrounding a poor yet sturdy family, the Baxters, living amongst an island of pines post Civil War. The story is written primarily from the perspective of their only son, Jody, whose life revolves around his father and pet fawn, Flag. Ora Baxter, Jody’s mother, is a hard woman; wrung dry from living with constant lack and loss. By the time Jody is born, she and her husband, Penny, have buried a small cemetery full of children. Jody is her only one to thrive. The thing about Ory, as her husband calls her, is her seeming inability to live beyond her hardships. Life is so difficult and every day is filled with work, and worry over having enough. She has lost so much and struggled so hard, she dare not ease her iron temperament lest she be overtaken with grief again. My children think she’s mean and hateful. I see into her soul and recognize the pain of loss always brewing barely below the surface. She dare not feel, for if she does she’ll come undone, never to recover and die hopelessly from her choking sorrow. Ory causes me to consider Katie, Francie’s mother in A Tree Grows in Brooklyn by Betty Smith written in 1943 and from – again – the growing child’s perspective. 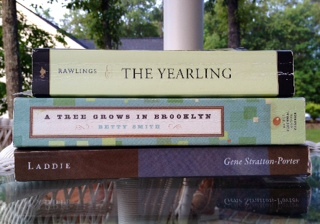 Where The Yearling spans a year, A Tree Grows in Brooklyn reaches through Francie’s entire childhood. Katie also isn’t the most likeable character. Like Ory, she carries seriousness with her, never dropping her resolve to raise her children into better opportunities than herself – daughter of an Austrian immigrant and marrying a handsome but drunk Irish man. Katie’s first child, Francie, barely survives the first year and then seems to grow small and stringy but somehow thrives – a fighter, Katie decides. Too soon, comes Neely, baby boy. By some miracle, Neely is born strong and healthy and beautiful. Katie falls instantly in love and determines that this one would need her doting and devotion more fiercely. Francie would be needed. Neely would be loved. Katie often makes decisions that seem against Francie, never offering her the favor she does Neely. More obvious is her guard, which is forever up – not unlike Ory, but less harsh and demeaning of others. Somehow, Katie stays softer to the world and those who occupy it. Where Ory is cutting, Katie is formal, calculating and forever moving: moving to keep her family afloat when her husband cannot, moving her children forward into better circumstances, moving herself further away from feeling the pain of her children’s hunger, their lack of everything, her own harsh childhood… always moving to avoid pain. The matriarchal hero of Laddie lives considerably less weighted by life. Her family, while not wealthy, lives comfortably amongst acres of farmland, orchards, barns and livestock. The story is told primarily through Little Sister’s eyes, youngest of 12 children – two who died before the story begins. Mother has lived through great loss and great hardships, but rather than allowing such trouble to shape her towards Ory’s hardness or Katie’s stoicness, Mother stays pliable and alive to her children, her husband and her community. I remember reading Laddie and daily laughing at her contortions to impress her son’s new lass; or cheering at her witty response to a mean neighbor’s criticisms; or crying with her when visiting her twin girls’ graves on the hill beside their church. Mother is my hero. In each woman I see slivers and chunks of me. Some of it scares me, some of it soothes, some of it inspires. Ory’s harshness to hold pain from boiling over. Katie’s doggedness in preventing the same. Mother’s desire to do well with what she’s been given – her children, her husband, her land, her community. Her unabashed need to make good first impressions. Her pride in her family and her sharp tongue when protecting them – and sometimes correcting them. If we are vessels – clay pots – formed and shaped and smoothed by the hands of God, then mothers must be the epiphany of design. Our shapes and capacities are formed by the Master Potter to hold and pour out uniquely into the lives of those He gives us to nurture and grow. Sadly, rather than honor and respect one another’s designs, we tend to judge and criticize. Rather than confess our own lumpiness and support others through theirs – trusting in the Potter’s masterful hands, we create rules and standards, trying to make everyone look and act like Corel rather than handcrafted art from Seagrove. I see the lumps and unevenness in these imaginary women’s lives. As I relate to their characters, I am softened by their imperfections. And through them I understand, it is in the relating and shared vulnerability (led by faith in the Potter’s love and release to His design), not the criticizing (which takes no faith at all), that we become more pliable for God’s continued shaping into individual vessels of essential beauty. Beautifully written…and great for inspiring additions to my reading list! Beautiful and breath-taking. Thank you. Thank you for commenting, Laura! I had forgotten all about this post–though not the ideas behind it. I think your timing for reading and commenting was divine. I needed to be reminded of why I tarry with literary pursuits….Blessings to you!